cockroaches and some varieties of the American cockroaches have been found. Cockroaches are not necessarily a sign of a dirty kitchen, even the cleanest kitchens can harbour them. 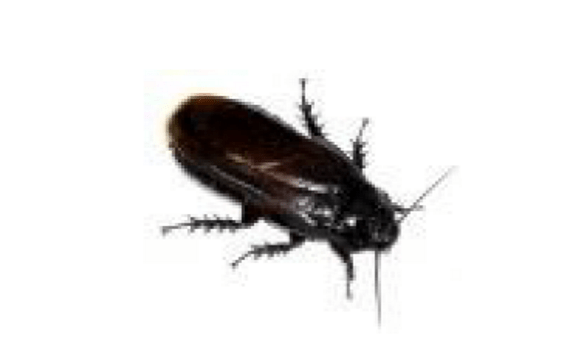 However, it has been estimated that for every cockroach you notice running around, there can be up to 1,000 undetected crawling throughout your home or premises. Leaving your cockroach infestation, with the hope it will go away, is not an advisable step to take! Adult cockroaches live on average from about 4—14 months +, during which time a mature female can produce up to 50 egg sacs, each sac contains up to 30 eggs. We do not want to alarm you but according to scientific studies “ a common pair of German cockroaches can easily have over 100,000 descendents in just a year. Access to food and water – kitchens behind cookers, fridges, toilets, back of drawers and even behind peeling wallpaper. Concealment, cockroaches avoid light and hide in any cracks or crevices and come out to forage from around dusk to the early hours of the morning. Society based, you will never see one cockroach as they like to stay in groups. Cockroaches are not fussy eaters they will eat almost anything from hair, leather, wallpaper or books. It is said that a dozen cockroaches can live for a week on the glue of just one postage stamp! Cockroaches have been implicated in the transfer of disease, it has been stated that “ they are the bearers of pathogens such as salmonella and staphylococcus. They have been associated with the outbreaks of gastroenteritis, typhus and skin diseases such as urticaria” . Contact with cockroaches can lead to a number of allergies such as dermatitis, rhinitis, and bronchitis and asthma. They have been known to taint human food and some people have phobias and can suffer anxiety attacks on seeing a cockroach. Before the Pest technician arrives, your property must be thoroughly cleaned, especially in the kitchen and bathroom areas. The technician will check your property to get an idea of how bad the infestation is, then will commence treatment. You will be expected to leave the property for up to 4 hours after treatment has commenced, due to the strength of the chemicals being used. Do not vacuum the floor for a period of 10 days, sweeping will be fine. We would recommend not to leave unwashed dishes in the sink overnight, but to clean up food spills and crumbs immediately. Store food in tightly closed containers, food left out for pets should have lids on them and avoid leaving out more food than your pet can eat. Inspect incoming grocery bags, boxes, sacks of potatoes, onions or soft drink containers for any hidden insects and their eggs, in addition to repairing any dripping taps. Remember keep clean the spaces around ovens, refrigerators and cabinets. Depending on how bad your infestation is, the technician will recommend further treatment.